This results in a longer-lasting carbon which acts as a release point for the bacteria in Outbreak! to bring more benefit to your aquatic system. Already proven the world over for organics control, Outbreak! will replace your ordinary carbon with Living Carbon. It’s alive! ATM introduces Supernova Living Carbon. Combined with the awesome organics consuming power of ATM Outbreak!, this pro grade activated carbon is seeded with millions of powerhouse bacteria and their enzymes that break down organics that make their way into the carbon. 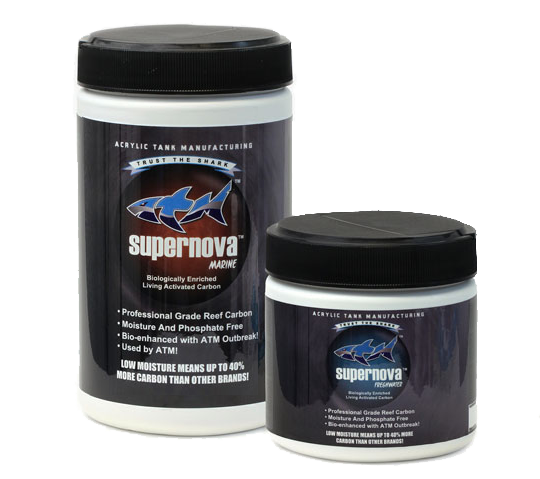 Supernova is a non-pelleted, superior bituminous reef carbon that is not forged with binders found in pelleted carbons. These binders will break down over time and rapidly if using the powerful bacteria enzymes in ATM Outbreak!. That is why a higher quality carbon will always be in its natural state, providing far more surface area and filtering potential, not to mention impervious to beneficial enzymes! Supernova Living Carbon contains the most quality, bituminous carbon than any other product. This is partly because it contains no resins for phosphate removal. Phosphates are best removed quickly and efficiently with lanthanum chloride, found in ATM Agent Green. This eliminates the need for phosphate reducing resins altogether, letting carbon focus on it’s filtrating tasks 100%. Carbon is one of the most powerful filtration tools available. Its remarkable abilities in removing pollutants, colors, odors, toxic gasses, and residual medications proves unique and unmatched. But not all carbon is created equally. Generally, the higher the quality of the carbon, the better the filtration results. Carbon’s ability to capture and retain organics, however, is also what has traditionally caused many to not use it as often as they would like in more sensitive systems such as discus habitats and reefs. These combined organics continue to release problematic compounds. They also limit the carbon’s filtering capacity. Supernova is seeded with the organics consuming power of Outbreak! bacteria. This innovation has simplified and rendered carbon more effective and practical than ever before. Due to its unmatched surface area, composition, and rough surface, carbon acts as the number one choice of housing for the aerobic autotrophs (nitrifying bacteria) that make up your system’s bio-filter. Nitrifying bacteria will choose carbon as their home over any other media nine times out of ten, in other words. Most carbons have moisture added to it, giving you less carbon and more water for your buck. Supernova Living Carbon has zero added moisture, which means you get up to 40% more carbon when you go with ATM. This extra carbon allows a longer use and double the regular volume usage than other carbons.